Where else in the world can you explore some of the world’s most spectacular caves; kill your own chicken and then eat it and get a duck pedicure, all in one day? If you haven’t heard of Vietnam’s Phong Nha-Ke Bang National Park, you are not alone. Neither had I until recently. But having just spent five incredible days there with my family, it is without a doubt one of the most breathtaking and exciting adventure destinations yet to be discovered by the rest of the world. How did we end up there? Purely by accident. My husband stumbled upon an article about the worlds biggest cave, discovered by a farmer out on a hunting mission in Phong Nha. At over 5km long, with sections reaching up to 200m tall and 150m wide, the cave – Son Doong – is large enough to house an entire New York City block. On reading that the area was home to hundreds of other cave systems and spectacular underground rivers, we decided that we had to visit. 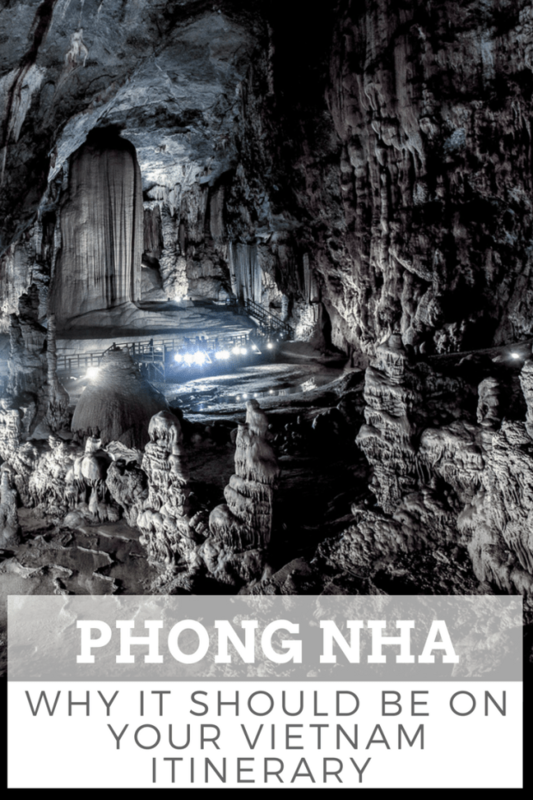 I’ve come away from Phong Nha feeling wildly enthusiastic about the region and want to raise awareness in the hope that more people will visit and enjoy it as much as we did. With all the ingredients to become Vietnam’s adventure capital, it’s not yet an established tourist destination but I’ve no doubt that it will be soon. It is an area that will thrive and prosper with carefully managed responsible tourism, but it is worth being aware that it is potentially at risk of over-development and exploitation. In this blog, I’ll go though the main activities on offer and some of the best things to do with kids. I’ll also explain how to get there and get about once you are there. Phong Nha-Ke Bang National Park is situated in the Quang Binh province of central Vietnam, between Da Nang and Hanoi. Formed approximately 400 million years ago, the karst mountains that make up the national park are some of the oldest in Asia. The National Park was listed as a Unesco World Heritage site in 2003. 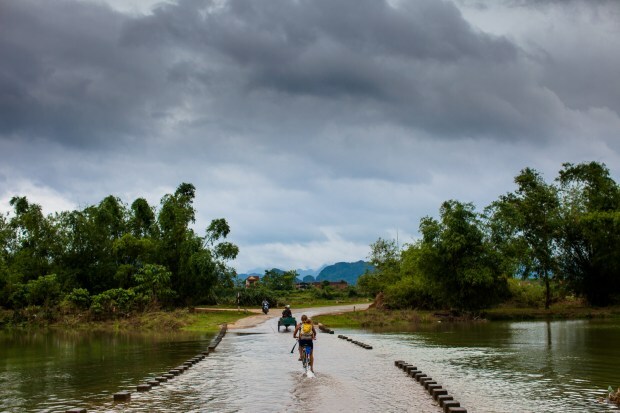 At the edge of the national park boundary lies the main settlement of Phong Nha – home to approximately 1,000 people and the base for the majority of travellers. Prior to the arrival of tourists a few years ago, the area was poor and relied on farming, fishing and hunting for income. Phong Nha was put on the map with the discovery of Son Doong Cave, after it was confirmed in 2009 as the world’s biggest cave. In recent years, Son Doong Cave has attracted the keenest of adventurers. But at $3,000 per person, a limit of a just few hundred people a year and a high level of fitness required, this spectacular cave is out of reach for most visitors. Luckily there are loads of other things to see and do within the national park – including caving/spelunking, zip-lining, jungle trekking, boat trips and bike tours – to surprise and delight travelling families of all ages. 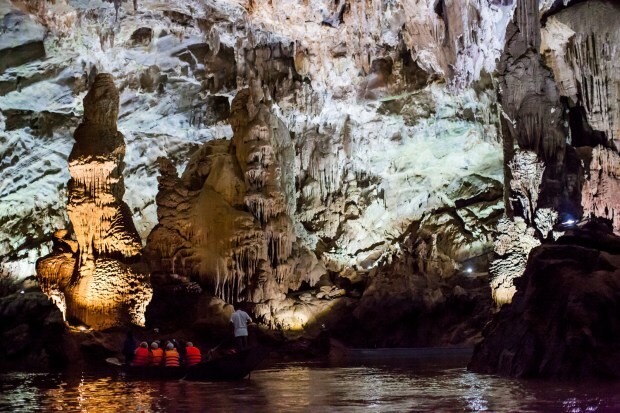 Phong Nha is the most easily accessible cave in the area and suitable for children of all ages. It’s not necessary to have a guide or join a tour and you can make your own way there. To reach the cave, you catch a traditional Dragon Boat from the Phong Nha tourism centre and take a scenic 30 minute trip up the river. Once at the cave, there is a quick change of boat and the journey continues deep into the heart of the cave in a rowing boat. After admiring the cave from the water, your boat is moored to a sandy embankment and you continue your journey, on foot, back to the mouth of the cave. 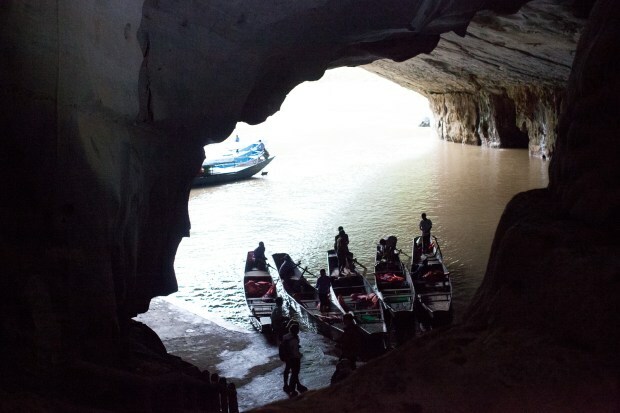 Being rowed around in the boat was a peaceful experience – the boat slipped silently through the dark waters and with each corner the cave revealed new delights – it was like Venice only darker and more underground! Our ‘gondolier’ was a lot of fun and, like most people we’ve met in Vietnam, lovely to our children. The cave is sympathetically lit throughout to highlight the incredible features. We loved looking at the stalactites and flowstone formations and comparing them to different animals (they all looked like jellyfish to my three year old). To keep costs down, try and share a boat. You can buddy up with other people at the Tourism Centre, where the boats leave from. Alternatively at a local, friendly backpackers called Easy Tiger, a group leaves together most mornings at 9am to share the cost of boats. Phong Nha Cave may be the easiest to get to, but Paradise Cave is a must-see in the Phong Nha-Ke Bang National Park. Prior to the discovery of Son Doong Cave, it was regarded as the largest and longest cave in the region and is an astonishing 31km in length. If you are only in the area for a day or two, make sure this is at the top of your to-do list. Independently – It’s really easy to reach the cave and explore the first 1km yourself and this is the option that we chose. This part of the cave is lit and fitted with boardwalks and stairs, meaning that the cave is accessible to all ages. I had my youngest daughter in a baby carrier and my three year old managed to walk almost all of it without being carried. The cave is located about 30 minutes drive from Phong Nha. There is no public transport here so we hired a driver from Phong Nha for 600,000vnd to take us to the cave and back. Entrance tickets are 250,000vnd per adult. Prices for children vary according to height, with children under 1.1m free of charge. For an additional 100,000vnd you can take a golf cart from the carpark to the base of the mountain or you can walk for 20 minutes. Either way it is a 600m uphill trek to reach the mouth of the cave. Guided tour – If you would like to explore beyond the first kilometer, you can book onto a guided tour. The 7km trek takes you into the dark depths of the cave. Armed with a caving helmet and headlamp, you will discover the incredible flora and fauna that thrive in the pitch-black conditions. Some of the route may be kayaked or swum and scrambling is involved. A minimum age of 10 is required by responsible operators. Difficulty rating: Easy for the 1st km self-guided walk, suitable for all ages. Guided 7km trek moderate in difficulty. Minimum age of 10. Dark Cave is not for the fainthearted. A cave for the thrill-seeking types, the experience includes a kayaked section, a ride on a zip-line, equipment and a guide. You will get very wet and very dirty and must be sure not to take any valuables with you. You can even enjoy a mud bath if you so desire! This is more suitable for older children and some scrambling is required. There is a weight requirement for the zip-line – you must be between 40kg and 90kg. 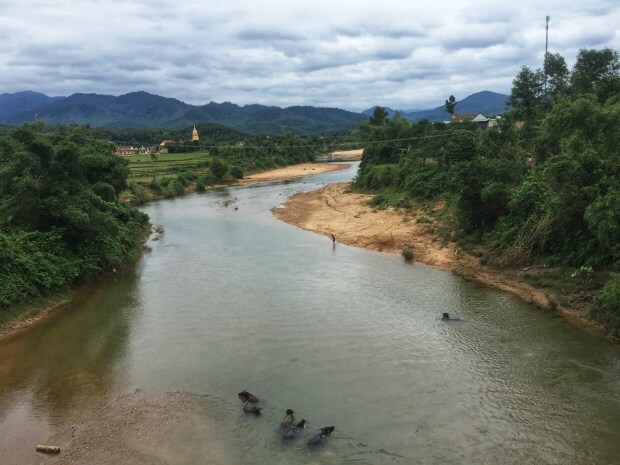 The Bong Lai Valley is a remote rural area just outside of Phong Nha, dotted with rice paddies, cows on the road and charming little villages. Tourists are still bit of a novelty so be sure to say xin chào (hello) to the locals and expect a warm reply. Wherever we went the local children found the sight of the four of us on bicycles very amusing! The small, winding tracks and bridges that criss-cross the valley are blissfully quiet. We visited on bicycles with my older daughter in a baby seat, provided by the wonderful staff at Phong Nha Farmstay. My youngest daughter was tucked up happily in the baby carrier. Motorbikes or scooters are another popular way to explore the area. There are a number of places that you can visit on a day out in the valley. The Pub with Cold Beer in Bong Lai is a great place to stop for lunch and is run by a lovely family. My eldest daughter had lots of fun playing with the owner’s children, who shared their toys with her and taught her how to use a spinning top. Chicken is the plat du jour, killed and cooked to order on a charcoal BBQ. If you really want to (and we didn’t), you can kill the chicken yourself. After lunch, relax in a hammock, play a spot of volleyball or hire a tube and go floating down the river. The Wild Boar Eco Farm is another option for lunch and serves up freshly cooked pork with stunning views out over the river. The Duck Stop is a quirky place that seems to be targeting the backpacker market. It’s located on a peppercorn farm, but unfortunately there was little information on that side of things which we would have found interesting. We sampled the pepper with peanuts and they were delicious but there did not appear to be any produce for sale. This family-run spot offers a ‘package’ of activities for 100,000vnd including duck feeding – which consists of putting on a Vietnamese hat and getting chased by hundreds of ducks that then nibble your feet – a ride on a water buffalo and sampling of some local foods. It’s a bit gimmicky and not really to our taste but my children loved the ducks. You can pick up a map of the Bong Lai Valley from Easy Tiger or the Phong Nha Farmstay. This is just a sample of things for families to do and see in Phong Nha-Ke Bang National Park. There is lots more that the area has to offer, including a range of activities and tours with something to suit all ages and abilities. There are not really any public transport options to speak of in the national park, so the best options for getting about are cycling, motorbike / moped, private car or on a tour. There are no taxi companies based in Phong Nha either, but your accommodation should be able to book you a car. There are several motorbike / scooter rental shops on the main street of Phong Nha. However, this option is only recommended for experienced riders. If you don’t fancy driving yourself, Thang’s Phong Nha Riders offer highly experienced drivers that can take you around the National Park. A full-day out will cost around 400,000 – 600,000vnd. A bicycle is a great way to explore the surrounding countryside and was our main mode of transport. The majority of roads are extremely quiet and drivers considerate – expect some well behaved ducks, cows and water buffalo on the road. Most of the accommodation options in the area offer bikes free of use to their customers. A driver can be booked through your accommodation or via any of the booking offices on the main street. Prices vary depending on how long you need the driver for, but expect to pay 500,000/1,000,000vnd for a half day/full day. Dong Hoi is the nearest city to Phong Nha and is easily accessed by train, bus or by air. 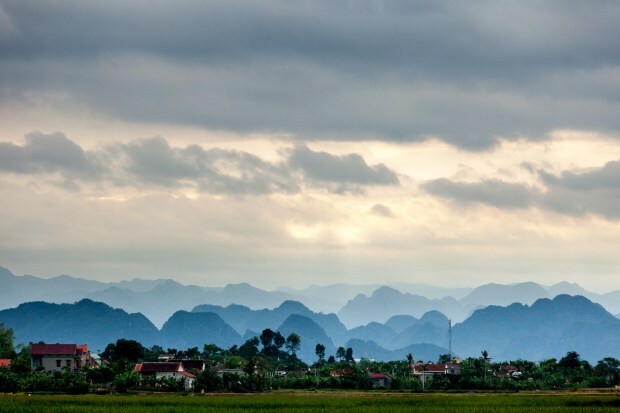 Taxis can then be taken from the station or airport to Phong Nha, a 30 minute drive away. Expect to pay about 400,000 – 500,000vnd. You should also be able to arrange a transfer directly through your accommodation. By train – There are several trains a day that stop in Dong Hoi as it’s on the reunification line, running all the way from Saigon to Hanoi. We chose to travel by train from Da Nang, and it was a comfortable and scenic 6 hour trip. It takes 10 hours to Hanoi, 3 hours to Hue and 23 hours to Ho Chi Minh City. For all our Vietnamese train reservations, I’ve used the 12Go booking website as I’ve had trouble making payments on the Vietnam Railway site. We paid 190,000vnd for each adult ticket. It’s a good idea to book a few days in advance as the trains often get booked up. By bus – Buses run daily to key destinations. This is the cheapest option for reaching the area but can be slow. Ensure you book through a reputable operator. The bus services operated by Hung Thanh Travel have a good reputation. By air – Alternatively, a small number of operators fly in and out of Dong Hoi airport. There are direct flights to Hanoi, Saigon and now Chang Mai. We flew out of Dong Hoi with VietJet Air direct to Hanoi. Tickets were relatively cheap and cost 1,600,000vnd for all of us including baggage. The flight time was about 45 minutes. Tempted by the Phong Nha-Ke Bang National Park? Want to know more? Keep an eye out for my next blog on options for accommodation and eating out.